Today’s politicians rule, loot and instil fear with their power. 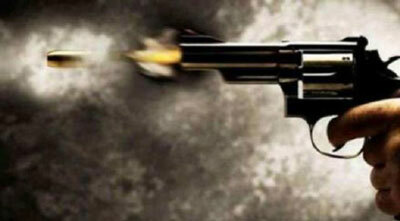 In recent events at a luxurious hotel in Delhi a man brazenly pulls out his gun after a tiff. Ashish Pandey is the man that you see in the below snaps (here after referred as pink panther) used his clout and power to run riot. The pink panther is a son of a former member of parliament (MP) and brother of a sitting member of legislative assembly (MLA). He picked up fights with other guests and then takes out a gun to show who rules. In a viral video he goes on to hurl abuses publicly and says “you don’t know who I am,… I am from Lucknow”. Most of the conversation is faint and unclear. The police has issued a lookout notice to capture the pink panther. The man at present is hiding in his den somewhere, the police has asked strict vigilance between Indo-Nepal border. Pandey’s uncle has gone out and defended his blood and said that the gun is licensed. Another question is how did he get a gun into the premises of the Lux hotel? Most of these star hotels check every vehicle entering, was his car unchecked because of his background or if it was a miss from the staff. This is something that the hotels need to buckle up with. This isn’t one such incident, there have been several in the past too. One recent act was of the Urban Bangalore Shantinagar MLA NA Haris’s son Mohammad Nalapad. This flag bearer of the Congress Youth wing attacked a youth at a high end pub over a frivolous issues. The youth suffered multiple fractures. This incident occurred few months before the Karnataka Elections in May of 2018 almost got the Congress in a tizzy if they needed to issue a ticket to NA Haris. The party later expelled his son and gave his father a ticket.